Why You Should Apply to be a Dairy Ambassador | Winners Drink Milk! Wanting to become a Dairy Ambassador for Indiana? 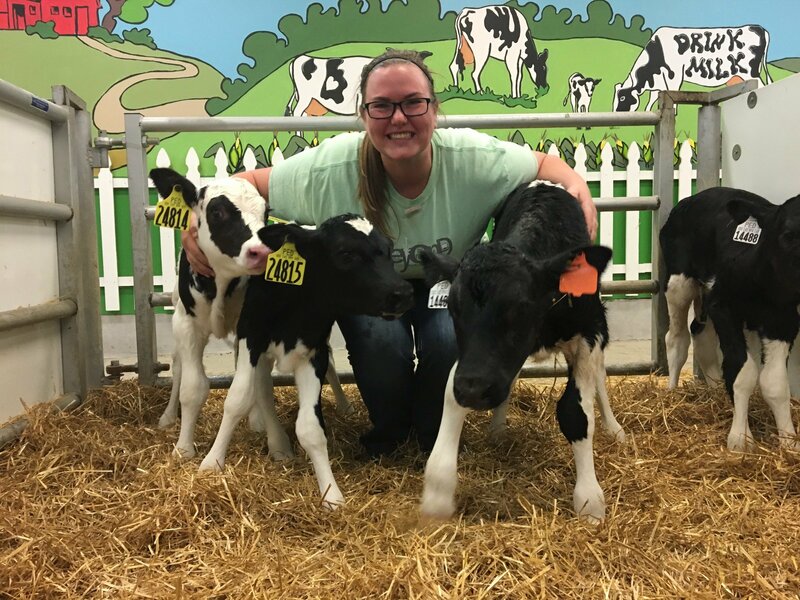 Hello, My name is Rachel Haynes and I currently am a senior at Purdue University studying Agribusiness Management with a minor in Animal Science. This year I have had the privilege of being selected to be a Dairy Ambassador for Indiana. Being a Dairy Ambassador has been on of the most rewarding things! Growing up in the dairy industry I have always loved cows, but the industry runs deeper than just about the love for cows, it is for all things dairy. Being an ambassador has given me the opportunity to advocate and inform the public about this wonderful industry. 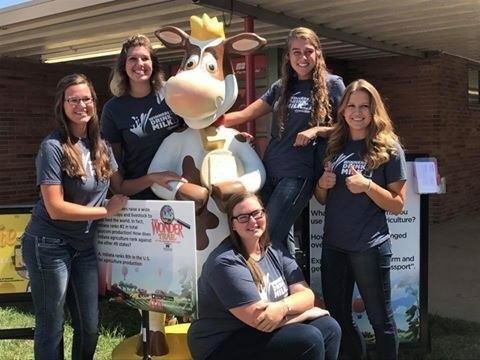 As applications are now open for the next round of ambassadors, I want to give you the inside scoop and “C” what being a dairy ambassador is all about! 2017-2018 American Dairy Association of Indiana Dairy Ambassadors. 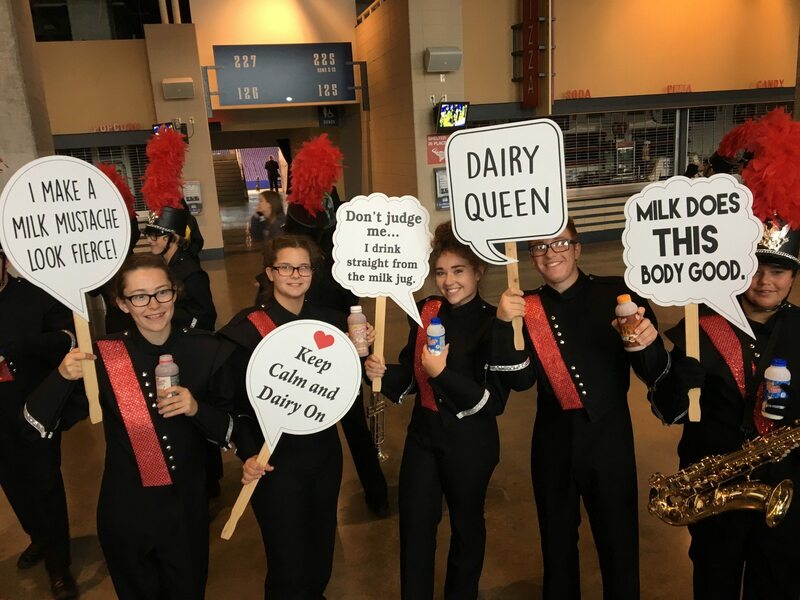 Handing out milk at the Indiana State Band Finals held at Lucas Oil Stadium. 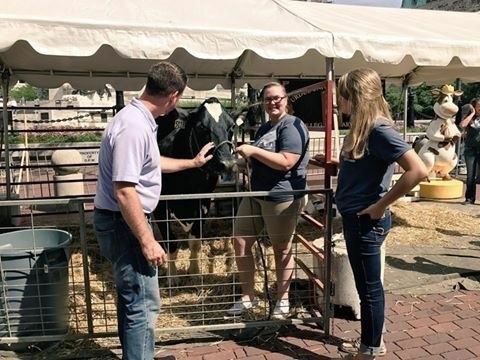 All the Dairy Ambassadors were able to spend a day at the Indiana State Fair. While here we attended a quarterly meeting of the board members of American Dairy Association Indiana. We also mingled in the dairy barn and served grilled cheese, milk, and ice cream at the Dairy Bar. Upon selection of being an ambassador you are committing to a one-year term of publicly advocating for the dairy industry! This factors down into one event a month although you aren’t limited to just one! Above is a look into some actives I was able to participate in! 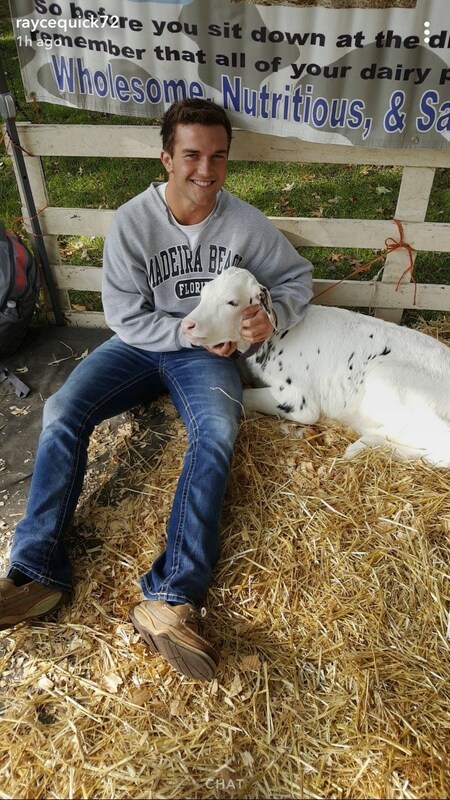 The activities I was able to attend this year include: Farm tour, Ice Cream Social, Indiana State Fair, State Band Finals, Fort Wayne Farm Show, as well as various projects that I was able to complete while still at school. The amount of people you meet is incredible, from farmers to consumers and everyone in between. In the short time of being an ambassador the amount of people I have reach and spoken with has truly opened my eyes to the amount of educating we still need do. Being able to promote the positivity of the dairy industry helps give a voice to the farmer and educates the public. Not only is this opportunity rewarding for the people you reach out to but it is also very rewarding to ones self. While being an ambassador we have the opportunity to attend events to help develop our skills. We are constantly communicating with the public, but a very rewarding event for me was being able to attend a seminar that helped develop how I communicate over social media. The skills and connections I have gained from being an ambassador will stick with me as I enter into the industry and career field post graduation. I loved talking to people who attended the Ice Cream Social Seeing the joy the calves bring to visitors and being held in Indy. Purdue Dairy Club brought a cow and a calf to the Ice Cream Social and it is always a rewarding experience to talk to people about cows. It is no surprise that the ambassadors all have a love for everything dairy, and we celebrate the greatness that comes with the industry. 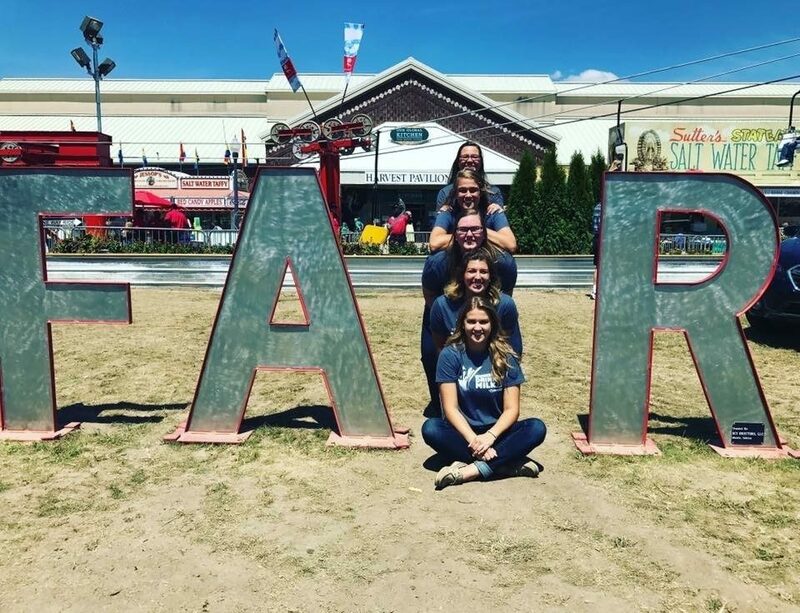 Whether it is visiting the cheese sculpture at the Indiana state fair, scooping ice cream at the ice cream social held in Indy, or always taking selfies and photos with cows whenever possible, we love to highlight all the events we attend and encourage everyone to come visit. Our job as dairy ambassadors is to help shine a light on all the positivity the dairy industry has to offer. Being a dairy ambassador has been a very rewarding experience. 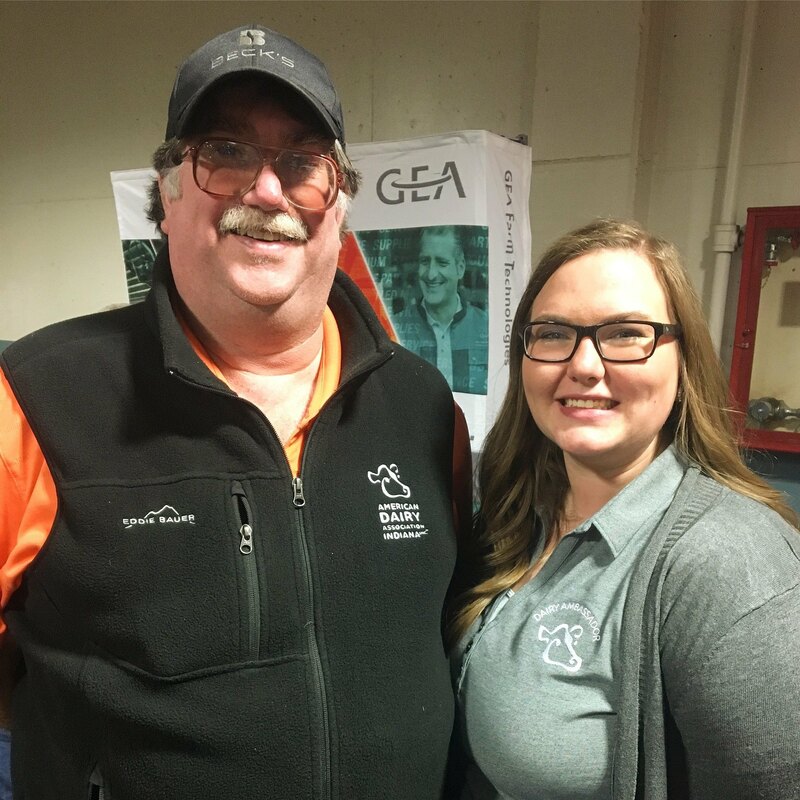 Although the term is only a year, the American Dairy Association Indiana develops their ambassadors to continue to promote the industry even after their year of service is completed.